In the span of about 5 days, I have gone from cringing in dread/fear to “oh he’s fine” when Oscar falls down. He has been standing and standing and standing some more for a week or so now and as of late, it’s ALL he wants to do. He’ll pull up on ANYTHING he can get a grip on, safe or not. I am close by and many times I even have a hand on his back or at least behind him. Of course those are the times he falls to the side. He lets go. The problem is, Oscar seems to be fearless. He’ll be standing up holding onto something and he’ll hear a noise and whip around to see what it was. Then comes the falling and subsequent boo-hooing and boo-boo kissing. The process is bittersweet. Of course I want him to explore new things. However, it also makes me sad because one day and one fall too many, and he will remember that scary time he hit his head or bit his lip or whatever and might not be quite so adventurous. I know I can’t protect him from the fear and I don’t necessarily want to. He needs to have a healthy respect for danger. This is how we learn. It’s not easy, but I at least now can say it’s getting easier. 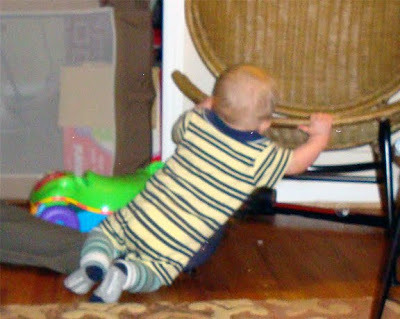 As Oscar ambles around the living room climbing and falling and climbing and falling, we both learn. He is learning his physical limitations and I am learning when to react and how to do it. I now know what tone of voice will startle him even more than the act of falling did, and how generous I need to be with my kisses. This morning when he tumbled over, Jerry (who doesn’t see him fall all day like I do) started to go for him and I said, Oh he’s fine. And he was. He didn’t even bat an eye. Our little baby is turning into a little boy. And I am becoming the MOM of a little boy. Sigh. Hooray! Thanksgiving is almost here! Goose eggs, scraped knees, puffy lips and cuts on the face have not slowed down Daniel. Don't worry. They forget quickly! yes they forget quickly and then climb back atop the table again. Moms of boys are the best! When our girl started walking we padded everything. Then she would run and smack into the wall! You can't pad the walls! !